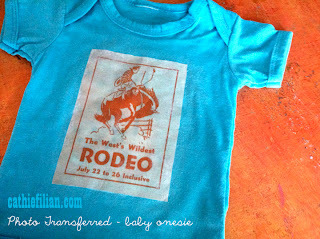 Cathie Filian: DIY: Photo Transfer Technique with Mod Podge and it's on a baby onesie! DIY: Photo Transfer Technique with Mod Podge and it's on a baby onesie! I am smitten with the new Photo Transfer formula of Mod Podge. You can transfer black and white or color copies to fabrics, glass, tin...etc. For this project we used a baby onesie from the dollar store and graphics from The Graphics Fairy. We have a video on this technique coming soon! You will need: Mod Podge Photo Transfer Medium, Toner Copy of Image, Foam Paintbrush, Pre-washed Baby Onesie, Copy of Image, Wax Paper, Wet Sponge. Trim your copy to fit the onesie. Squeeze a dollop of Transfer Medium onto the top of the image. Slip a piece of wax paper in between the onesie layers. Position image (wet side down) on the center of the onesie. Wet the image and let it soak for 2 min. Working in a circular motion, rub away the paper. The image magically stays! Enjoy! Allow to dry. Wash cold and Hang dry. oohhh I must go get some of that!! Is there a specific paper to use (like cardstock, shiny photo paper)or will plain copier paper work?? So I'm sort of in love with this... I have a BILLION ideas!!! Thanks for the tutorial!! This is great! Did you have any problems with them coming off in the wash? I assume they will over time, but hopefully not too quickly. is wax paper the same as baking paper ? and what do you mean whit "Toner Copy of Image" can't you just use a print out from a normal inkjet printer ? (on normal paper)? Not inkjet. It must be a toner copy like from Kinkos or a copy machine. Wax paper is different from baking paper. It is coated with wax so the medium won't soak through. You can use a piece of plastic. I've wanted to try this mod podge, but I'm wondering how many images you were able to transfer with the one bottle. I noticed it only comes in the 2 ounce bottle at my local stores and on amazon. Thanks!!!! Michaels will have a larger bottle very soon. The 2 ounce will cover more than you think. For this size of transfer it used about 1/8 of the bottle. Thank you so much! One more question...Do you think pictures from calendars would transfer over or should I go the fabric Mod Podge route? This is a trip. When I first started using Mod Podge years ago I only found gloss, so now I'm just over the moon with all of the variety! You will need to make a toner copy (at kinkos) of the calendars. The Photo Medium reacts with the toner to make the transfer. Hope this helps. I LOVE this. That baby onesie is so cute. What a great gift idea! Thanks for the easy-to-follow tutorial. I will DEFINITELY be trying this. YAY MOD PODGE!!! I just recently found a place with black and white toner copier I don't think i will ever find a place that has color :-( Thanks for sharing! If they have a color copier, it is toner based - meaning dry powder "baked" onto the paper. Ink Jet uses ink and sprays it onto the paper and is absorbed into the fibers. Dry powder (toner) copier/printers use heat to bond the powder to the paper surface, it doesn't soak in. So you are transferring the powder to another surface. This is how it was explained to me by the printing place. They said that laser printers are dry transfers also. Hope that helps!